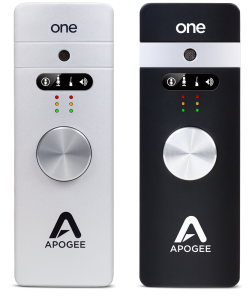 This tutorial will show you how to connect Apogee ONE to iPad, iPhone or iPod touch. To follow this tutorial you will need ONE, iOS version 5.1.1 or greater and a compatible iPhone, iPad or iPod touch. Connect the provided external power supply to ONE or insert 2 AA batteries. If you use the external power supply, ONE will charge the iPad or iPhone. Use batteries if AC power is not available. Connect ONE to your iPad or iPhone using the provided 30-pin iOS cable or Lightning cable. Now on your iPad or iPhone, open Settings and choose General, About, ONE, then choose “Find App for Accessory”. The App Store will launch and navigate automatically to the Apogee Maestro app. Once you’ve signed in to the App Store, click INSTALL to download Apogee Maestro. Plug in your headphones, and play a song. Now your ONE is set up and ready to go.